Thinking about choosing a veterinarian for your new dog? Where do you start? Usually, when picking a veterinarian, we thumb through the phone book until we find one close to home. But just like a doctor, you might not be happy with his “bedside” manner. I’ve heard people complain that their animal’s veterinarian doesn’t handle their animal well or they just didn’t like his manner. 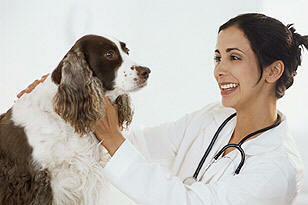 Below are some helpful hints in choosing the best veterinarian for your animal. If you have friends, family or neighbors with animals, ask them for a recommendation. If they do, ask questions about their experiences with the vet. How does the veterinarian handle their animal? Is he gentle? Does he thoroughly explain to the pet owner the health of the animal after being looked over? It’s good to choose a veterinarian that is informative about the animal he is checking. A veterinarian not only has to be good with animals, but he has to be people friendly as well. Don’t forget your instincts. After meeting the vet, if you don’t feel good about him, don’t go back. Even if he has a good reputation, don’t feel pressured to go back. What is good for one person, may not be good for you. Look up the Veterinary Medical Board and see if he has been any complaints again him. This way, you can eliminate without having to go any further. You can also check with the American Animal Hospital Association (AAHA). These are vet hospitals that have achieved high animal care standards. These vet hospitals fill out a detailed explanation of its equipment and services they offer. Afterwards, a consultant inspects the facility to ensure it meets AAHA’s standards. The following areas are checked: medical records, dentistry, anesthesia, dentistry and surgery. Knowing this, may give some dog owners peace of mind before taking their animal for and of the above reasons. There are only around 17 percent of vet hospitals around the US and Canada that are affiliated with the AAHA. You can find them by going through the Healthypet’s Hospital Locator. Make an appointment to meet the veterinarian as well as the staff. How do they interact with customers as well as each other? While you’re there, ask for a tour of the facility. It would be a good idea to not ask for the tour in advance. This way you can see how the facility is kept without being warned of a visitor. Look for cleanliness especially in the kennel area. If you see unclean kennels or droppings on the floor, it might mean they do not have enough staff to care for the animals. Sanitation is important due to the spread of diseases among animals. Also, ask the vet if it would be ok to sit in during a treatment of an animal. This way you can see how he handles the animal as well as the pet owner. You can also see if he has a genuine care for animals or does he just see it as a job? Any veterinarian practicing in the United States has to of graduated from an accredited school. Just like any doctor, he must have a license that should be on display. If you don’t see one displayed, ask him about it. Check to make sure it is a current license. Ask about emergency care? Is it even offered? Accidents can happen to your pet, and they don’t always happen during the 8-5 Monday thru Friday schedule. Is there 24/7 emergency pet care? Find out if your dog does have to stay overnight, will there be a member of staff staying with him? If possible, get a good veterinarian that is close to home. You don’t want to drive an hour away if you have a restless or hurting dog in the back seat. If you have pet insurance, find out if they accept it? If not, what about credit cards or payment plans? Vet bills, especially emergency bills, can be costly. Do your homework if you want to get a respected veterinarian that you feel safe going to. Visit several veterinarians before making a decision, and then compare notes. Finally, go with your instinct.